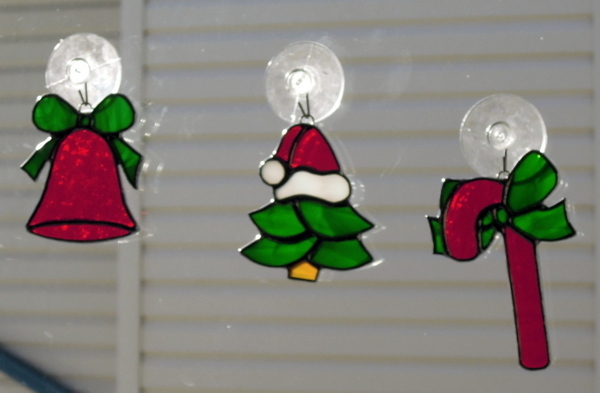 We have clients who commission us each Christmas to come up with an unique suncatcher stained glass gift item for their grandchildren. 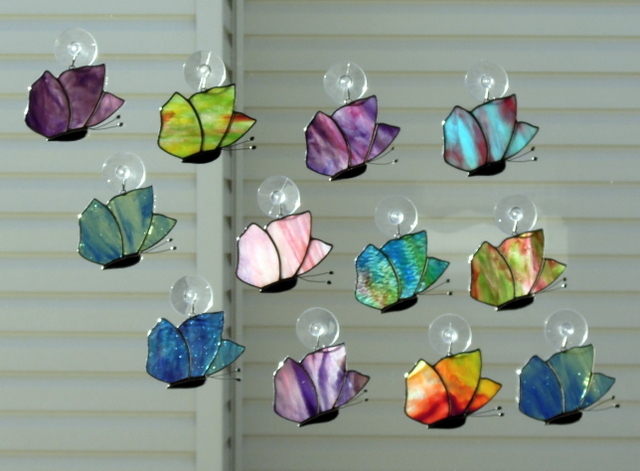 This year we made these 12 butterflies using Youghiogheny Heads & Tails glass. This year we made this Treble Clef for Jaylene one of our next door neighbours daughters. Jaylene is a very talented young singer and musician. This ornament measures approximately 2.5 inches x 4 inches. Each year we make Christmas Tree Ornaments for our next door neighbours daughters. 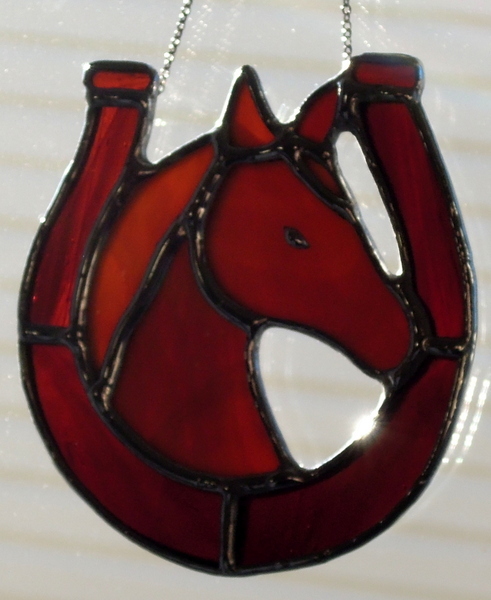 This year as Julia is into horseback riding we made this horse shoe ornament for her. This ornament measures approximately 3 x 3 inches in size. The Red Deer Hospital Foundations Festival of Trees, has been using this wonderful white branched, white lighted tree for this year and many past years to display our stained glass. Enjoy and we wish you all a Merry Christmas and a Very Happy New Year. 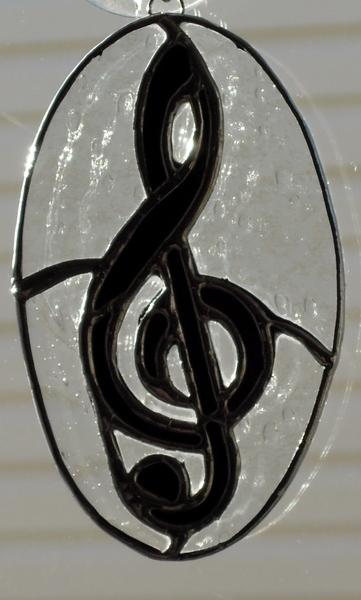 Once again we will have many stained glass items in the Gift Store at this year’s Red Deer Regional Health Foundations Festival of Trees. The event is held at Westerner Park in Red Deer Alberta, and the hours are Friday November 28th and Saturday November 29th from 10.00 am to 9.00 pm and on Sunday November 30 from 10.00 to 4.00 pm. This is our 11th year of supporting the Health Foundations Fund Raising activities and we encourage folks to attend to see the incredible displays and to support the Foundation. 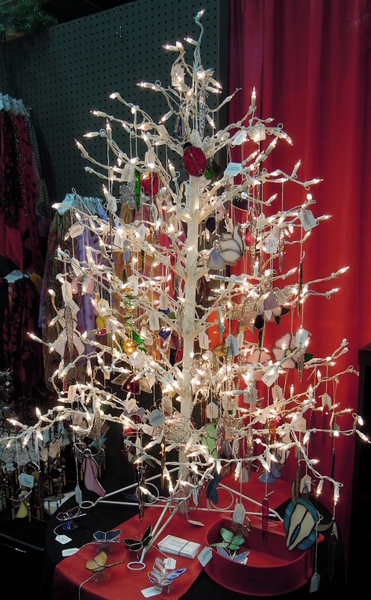 We have many different Christmas tree ornaments, angels, shamrocks, icicles, hummingbirds, crosses, beveled snowflakes, butterflies and many other intriguing items to bring Christmas joy to your home this holiday season.